Hello Friends! I hope you have been well. I have been working, and working, on a quilt that refuses to get done. You know sometimes, there is that one quilt that just ends up being a bit problematic. Well, my latest completed quilt was a bit like that. I will have sneak peeks for you in a different post. You may recall I had used Made With Love fabrics in the pillowcase I made for American Patchwork & Quilting’s 1 million pillowcase challenge. Click here to read more. I have also used the fabrics to make Miss Baby’s thread spool stitchery into a hanging pillow ornament. Click here to read more. Click here to view the entire Made With Love fabric range. Click here to download Sew Lovely pattern instructions. Thanks for stopping by. 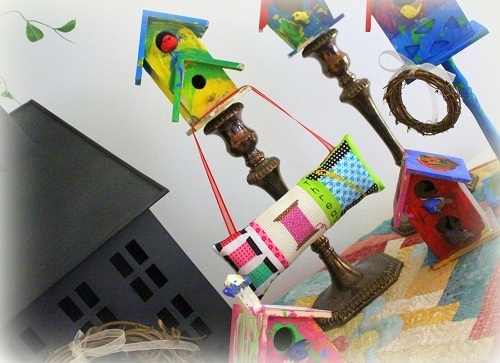 I hope you have been able to squeeze in a bit of crafty/sewing fun this Christmas season. If so, what have you made? 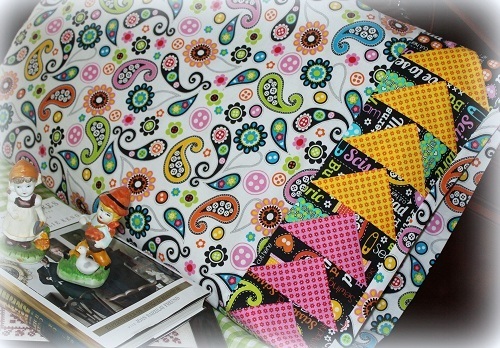 This entry was posted in Quilt Pattern, Quilting and tagged Benartex Made With Love Fabric Line, Free Button Quilt Pattern, Wendy Sheppard Designs. Bookmark the permalink. Now you have made my day. I spent 4 hours this afternoon with my mom and dad at the dentist getting mom a crown. Good grief. I am wiped out. We left and it was dark outside. I love this pattern so much. I love sewing themed fabrics and have a few in my collection box. Did I tell you I am gonna be a gramma? Oh gosh, yes. My oldest daughter surprised me on Thanksgiving with a gift wrapped frame. I was clueless – opened it and burst into tears at her sonogram of 8 weeks. The little pip is due in June! I hope you are having "Happy Holidays" and really, enjoying preparing for Christmas. Cute new pattern. I have a stash of “sewing” fabrics. When I collect a few more I will have the perfect pattern. Thank you. I still need to make nine Gkid monogrammed pillowcases before the big day. A holiday tradition for ten years. I better get with it!! Those buttons make such a cute addition to those cute themed fabrics. You always do such a nice job and come up with the best ideas. What a fun design. 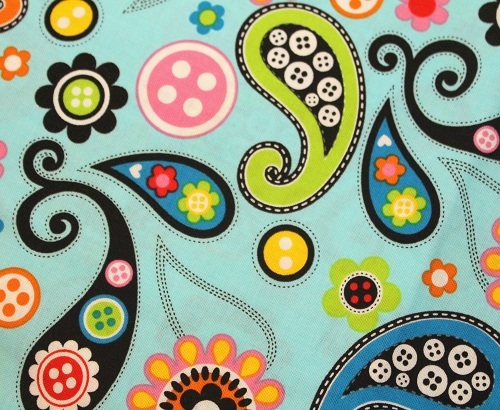 Love the buttons and what delightful fabric. Thank you for the free pattern. This is such a cute quilt!! The first thing I noticed was the thread and sewing machine borders. 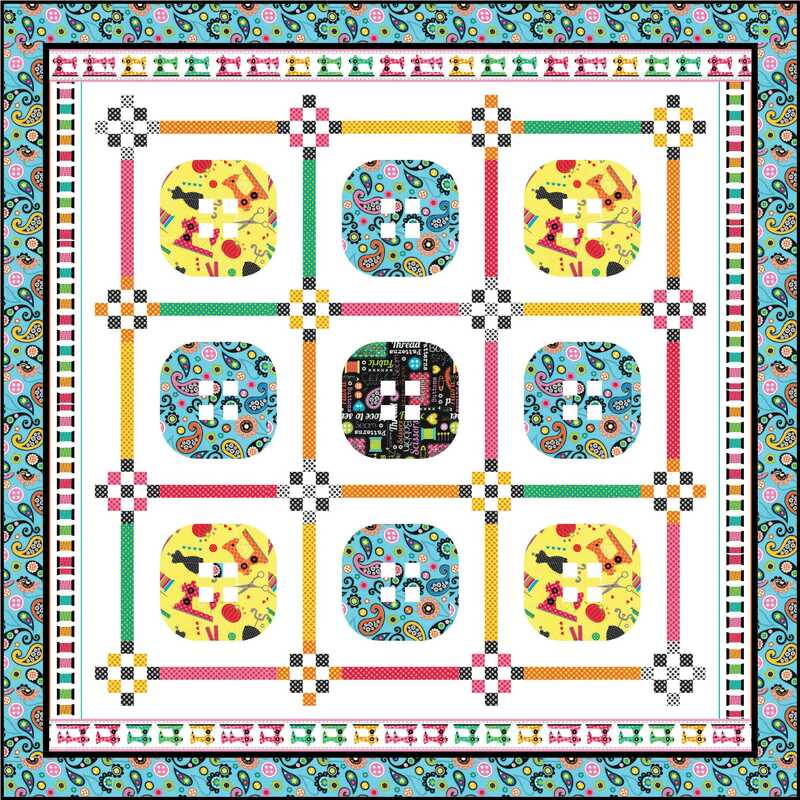 Wouldn’t this just be a fun quilt to display in a sewing room. Loved seeing Miss Baby’s progress with her needlework. I love your patterns and appreciate that you post them for free use. I am having trouble printing them so that I can use them in the form that they appear in. The two pages are too large to print on one page of paper. If I shrink them to fit the page I can’t read the print and the templates are not the correct size. Would it be possible to change to a 4 page format? Thank you.